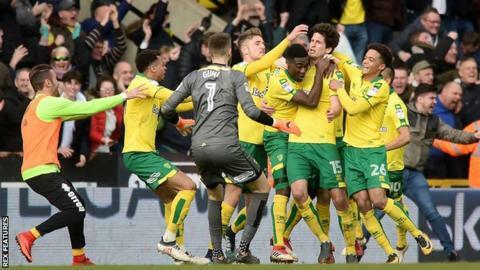 Timm Klose's header deep into stoppage time for Norwich denied Ipswich a first East Anglian derby win since 2009 in a dramatic finish at Carrow Road. The visitors thought they had snatched victory in the penultimate minute of normal time as Luke Chambers headed in from a corner after a tense, even game. But Klose nodded in with effectively the final touch to earn Norwich a draw. Ipswich had controlled a goalless first half, before the Canaries responded with a brighter second-half display. Ultimately, the draw did little to help either of the mid-table sides' relatively slim play-off hopes. But the Norfolk club went home happiest after rescuing a point and denying Ipswich boss Mick McCarthy his first win in the fixture. Having switched to a three-at-the-back system, the Tractor Boys had the better of the first half but Norwich keeper Angus Gunn palmed away Martyn Waghorn's deflected set-piece shortly before the break. The Canaries improved immediately after half-time, but Bartosz Bialkowski saved two well-hit James Maddison free-kicks, before also doing well to turn away Nelson Oliveira's bouncing effort. The hosts' late pressure appeared in vain when Chambers nodded in at the other end, and the home fans were heading for the exits as Grant Hanley chased a seemingly lost cause to keep the ball in at the byeline and delivered a perfect cross for Klose to nod in and prompt scenes of wild celebration. After the drama of the two late goals, the result left both sides level on points, eight below sixth-placed Bristol City. "Obviously it was a big setback for us when we went behind so late in the game, but with this group I always know they have the mentality to come back, the fitness to come back and always have the ability to score a goal. "The stats show that we have scored more goals in the final 30 minutes of games than any other team in the Championship this season - and this was another one. "Sometimes a late equaliser like this feels better than an easy win, even though you are only getting one point. "I thought it was a typical crazy derby game, with aggressive tackles, duels and the two late goals." "I thought we played very well but we just let our guard down in the 95th minute. "In the first half I thought we attacked and defended well and in the second half we worked really hard, got our blocks in and got our goal near the end. "I would say we did our job well for 95 minutes, but unfortunately we couldn't see it out." Match ends, Norwich City 1, Ipswich Town 1. Second Half ends, Norwich City 1, Ipswich Town 1. Goal! Norwich City 1, Ipswich Town 1. Timm Klose (Norwich City) header from the centre of the box to the bottom left corner. Assisted by Grant Hanley with a cross. Offside, Ipswich Town. David McGoldrick tries a through ball, but Martyn Waghorn is caught offside. Substitution, Norwich City. Mario Vrancic replaces Harrison Reed. Substitution, Norwich City. Onel Hernández replaces Alexander Tettey. Martyn Waghorn (Ipswich Town) wins a free kick on the right wing. Goal! Norwich City 0, Ipswich Town 1. Luke Chambers (Ipswich Town) header from the centre of the box to the bottom left corner. Assisted by Martyn Waghorn with a cross following a corner. Corner, Ipswich Town. Conceded by Harrison Reed. Jordan Spence (Ipswich Town) wins a free kick on the right wing. Cameron Carter-Vickers (Ipswich Town) wins a free kick on the right wing. David McGoldrick (Ipswich Town) wins a free kick in the defensive half. Offside, Ipswich Town. Cameron Carter-Vickers tries a through ball, but Martyn Waghorn is caught offside. Attempt missed. Harrison Reed (Norwich City) right footed shot from outside the box misses to the left. Assisted by James Maddison. Jordan Spence (Ipswich Town) is shown the yellow card for a bad foul. Foul by Jordan Spence (Ipswich Town). Martyn Waghorn (Ipswich Town) is shown the yellow card for a bad foul. Timm Klose (Norwich City) wins a free kick in the defensive half. Foul by Martyn Waghorn (Ipswich Town). Attempt blocked. Nélson Oliveira (Norwich City) left footed shot from outside the box is blocked. Assisted by James Maddison. Substitution, Ipswich Town. Jordan Spence replaces Dominic Iorfa. Corner, Norwich City. Conceded by Bartosz Bialkowski. Attempt blocked. James Maddison (Norwich City) right footed shot from outside the box is blocked. Assisted by Moritz Leitner. Foul by Luke Hyam (Ipswich Town). Offside, Norwich City. Angus Gunn tries a through ball, but Nélson Oliveira is caught offside. Attempt saved. Nélson Oliveira (Norwich City) right footed shot from outside the box is saved in the bottom left corner. Assisted by Josh Murphy. Attempt missed. Jamal Lewis (Norwich City) left footed shot from outside the box is high and wide to the left following a corner. Attempt blocked. Josh Murphy (Norwich City) right footed shot from the centre of the box is blocked. Assisted by James Maddison. Corner, Norwich City. Conceded by Cameron Carter-Vickers. Harrison Reed (Norwich City) wins a free kick in the defensive half.